Fixed an issue where Aerakyn’s would sometimes show mirrored particle effects at their feet. Fixed a UI related crash in the client. Tinkering trainers are now available on the Race to Trakanon server! Tunare’s Battleweary ability should not trigger as quickly allowing more time to complete the encounter. Encounters within Sundered Splitpaw will set a zone lockout timer when killed. Adjusted difficulty scaling in agnostic dungeons that can scale to level 100. Scourge Watchman’s Quiver is now 36 slots. Marketplace quivers are now able to hold both arrow and throwing ammo types. Wave two starts July 15th. Yes, each wave drops a different item. We will be doing double Ethereal tokens here some time in future also. UPDATE: It looks like this was a glitch as players are once again receiving just one Ethereal reward for completing the daily Ethereal mission. Interestingly, players have been reporting receiving two rewards instead of one since last night. Some were hoping there would be a Double Coin event, but instead it looks like we’re getting a Double Reward event. Unlike past Ethereal events, this summer’s Summer Ethereals are tied to completing a specific Mission (quest) for a daily zone. The rotation can be viewed in the right column of EQ2 Library. Fixed an issue causing the command /loadui to hang. Reduced the damage on several attacks from mobs in agnostic Kralet Penumbra zones. Fergul’s Dust Blind spell no longer requires line of sight to Fergul to be cast. The druid ring hireling is now available in the Highhold Guild Hall. A few technical issues have delayed this update an additional 2 hours. We’ll update you if an additional delay is necessary! Scourge Keep: The lockout timers for Scourge Keep [Heroic] and Scourge Keep [Advanced Solo] have been reduced to 3 hours. Santifier Goortuk should no longer increase his resolve values as if he was in challenge mode without Fergul the Protector being present. Justice for JoJo? – Coltang will appear even if your mercenary or pet helps you along the way. Fixed an issue causing house portals to stop functioning. The damage shield component of Banshee Skin cast by Rinis the Everslaved can now be bypassed by pets and mercenaries if their owners meet a specific requirement. Fixed a bug where the Unique house ID would get saved out improperly. The Grotto Sailing Ship guild amenity may now be moved after purchase. Corrected an issue with amenities in the Highhold Guildhall being placed in an odd location. The ethereal daily mission for Scourge Keep, Sanctify or Die, will only require the death of either Sanctifier Maknok or Sanctifier Yegigoth. Fixed a bug where characters who had a lot of spells in their spellbook would have it get jumbled when zoning, or logging back in. After this patch. Sort your spellbook once to your liking, then zone to make sure it saves out and you should be good to go! Avatar of Growth’s health has been reduced. 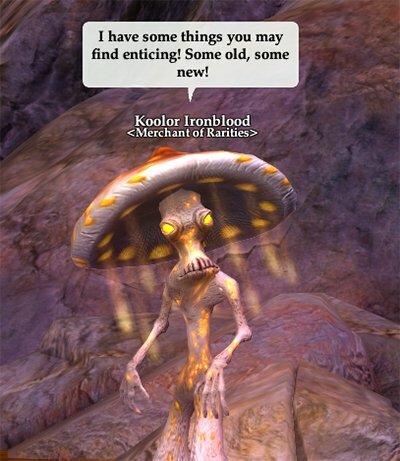 Merchant Rilsk in the Kylong Plains has a sneak peek of many rewards soon to be available during the Race to Trakanon! We already posted an article about them, but here’s the official announcement. Summer Ethereal Items are here! During the event players will be able to pick up Ethereal missions from the mission NPC’s in Thalumbra, the Ever Deep. These missions will grant you [eq2u]Umbrite Ethereal Coin[/eq2u]s, and a chance at the current accessory reward or an Ethereal Rune. 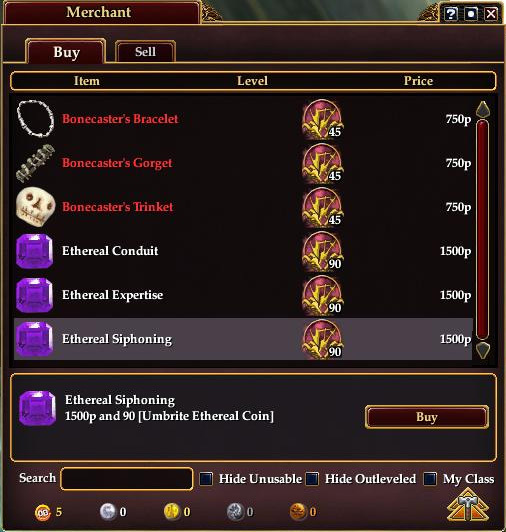 Umbrite Ethereal Coins may be used to purchase any of the available rewards from the Lylleia, the Ethereal Merchant. In addition, over the course of the event there will be several periods of time that award bonus Ethereal Coins. Starting TODAY and running until 11:59PM PT on Monday, June 13, 2016 players will receive DOUBLE Ethereal Coins. Don’t miss your chance to stock up on coins early, and pick up the Ethereal items that you’re looking for! This is in addition to the bonus that All Access members get every day to their alternative currency earned in-game. That means double DOUBLE Ethereal Coins for members during the times for bonus Ethereal Coins. With tomorrow’s update, the Summer Ethereals event goes live for 2016. In the past, I have come to view these events a mixture of excitement and dread. Yes, it becomes easier to find groups, however you have to be lottery-lucky to acquire these game-changing items as [eq2u]Phelony, Deathbringer[/eq2u], [eq2u]Fai Thass, The Ravager[/eq2u], and ability resetting items such as Essence of Duality. With the focus on weapons shifted to later this year, the Summer Ethereals this time around are jewelry — Necklaces, Bracelets, and Earrings. In addition, some of the very popular but exceedingly rare Ethereal Runes are now also available through heroic content this summer. A view of the Ethereal merchant as seen by a Mage. Different items are offered for Scouts, Fighters, and Priests. In years past, the only way to acquire these Ethereal items was through repetition. It might take 300 or more dungeon runs to acquire your preferred item. 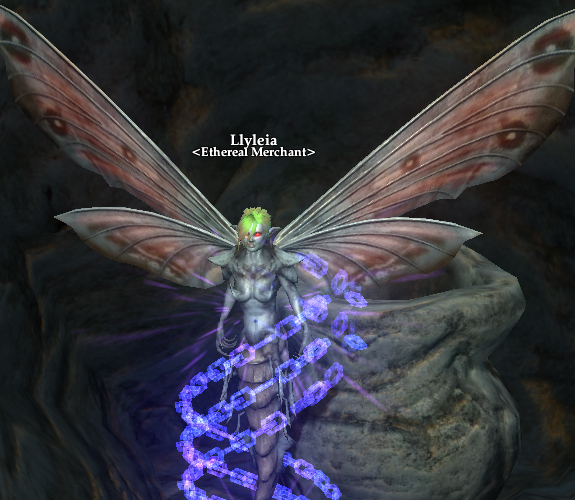 This year, the rewards are presented in such a way that you will either get an [eq2u]Umbrite Ethereal Coin[/eq2u], which can be used to buy Ethereals from a merchant, or you will get an Ethereal item. Please note that the Ethereal Coin currency is NO-TRADE which is necessary to keep the cost low. Update Notes: Tuesday June 7, 2016 — Summer Ethereals! Summer Ethereal Items are here! Characters may pick up a new mission that will grant an Ethereal Coin with a chance at an Ethereal item. Ethereal coins may be used to purchase Ethereal rewards at a new merchant in Thalumbra: the Ever Deep. Ethereal daily and weekly heroic missions are now available in Thalumbra! Speak to Holstin Coresprock for the daily mission and VV.E.E.K.I_.Y IIIissi0N5 for the weekly mission. Collectibles near Monolith of Woe and Ember Hive in Kylong Plains are no longer buried by snow or rock. Harvestables and shinies will now despawn 5 minutes after opened instead of 2 minutes. Tier 2 raid armor from the Scourge Wastes now grant the correct 6 resolve. Paying Homage to the Past – Is now available from Navarius Orvalis <Sage> in Freeport. The city Sages have received a huge shipment of Lore & Legend books, available for those who have completed the corresponding Mastery. Fearknight is now available to purchase from Noble Tark Validus <Loyalty Merchant>. Sanctifier Goortuk should now have lower resolve when fought in normal mode. [eq2u]Spine of Ancient Terror[/eq2u] now has the correct 14 resolve. Legends of Norrath loot card packs are now available on the marketplace. Specific campaign packs will be available for a limited time and will alternate after a set period. When opened, each Legends of Norrath loot card pack will grant a single tradeable reward bag. Once that bag has been opened the item contained within will be bound to that account. MMOs like EverQuest II can’t help but include a loot chase. While EQ2 offers many different styles of gameplay from crafting to decorating to soloing, those players who elect to group or raid find themselves on the loot treadmill and want to be able to point to forward progress. 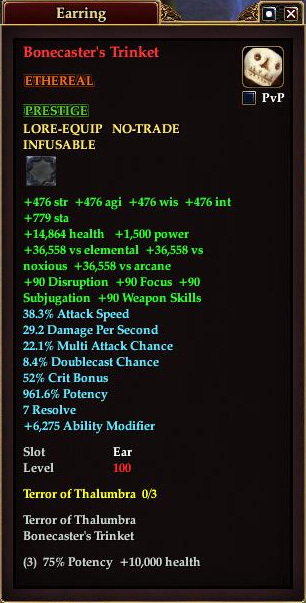 In recent years, the EQ2 team have scattered a few best-in-slot items throughout the content so that crafters and soloers get some “Whoa!” items. Still, most Progression items come from extremely difficult content that requires substantial coordination. There’ll always be that one ridiculously difficult heroic zone. There’s always that Wing 3 of raid content. With Terrors of Thalumbra as well as Altar of Malice (after some post-launch tuning), the heroic content has been made accessible so that more people get to enjoy it. But as with any organized sport, the tolerances between success and failure shrink the higher you go into more challenging fare. Time is zipping by as usual! I wanted to drop in and let you know what we’ve been up to. As you continue with the Terrors of Thalumbra expansion and take part in GU100, the team has been toiling away on future plans. And what are those? Well…. Encounter [enemy] resolve buffs have been reallocated to take stacking resolve buffs into account. EverQuest II players have a long memory. The unpopular Critical Mitigation stat was removed from the game over four years ago, yet player suspicion towards progression stats seems to have hardly faded in the intervening years. Buried amongst the update notes for GU100: The Siege of Zek came a new stat, Resolve. Even though the stat is thus far confined to the five strongest raid targets and does not affect Heroic content at all (at least until this fall’s expansion), players have responded strongly. Over the years, Crit Mit, Crit Avoidance, and Resists have all been used to stratify content and provide a steady treadmill for players to consume dungeons and vanquish raid content. However in the absence of one unifying progression stat, developers have fallen into a vicious cycle of compounding player power at an astonishing rate. Player damage output has grown by a factor of 5,000 in recent years. Whether we want it or not, we need a progression stat to keep growth of the other stats in the realm of sanity. Resolve, rather than a guaranteed death or failure, has been described as a kinder, gentler mitigation stat in our interview with the EQ2 team. The stat affects incoming damage for both players and enemies. 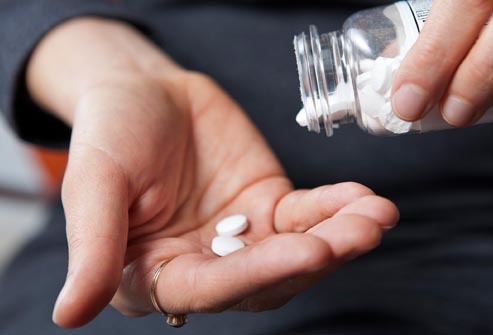 With exceptional healing, a shortage of Resolve can be worked around, while the reduction in damage received by the enemy may be an even bigger obstacle. On April 28th, EverQuest II launched its level 100 content release “The Siege of Zek“. The update takes us back to Zek, the Orcish Wastes and a lot has changed in 12 years. While the original level 35-appropriate zone can still be accessed, players may now choose to travel to the new level 100 Scourge Wastes. The update contains updated versions of classic Zek zones in Advanced Solo, Heroic, Event Heroic, and Heroic Contested versions as well as a Raid zone. Rather than a simple up-tiering of existing zones, the Designers and Art Team have put a lot into this All Access-only update with totally redone Orc models and many other touches that make this content feel fresh. As it had been a couple of weeks since the release of the Siege of Zek, we had an opportunity to peruse the official EQ2 forums for player questions and concerns. The EQ2 team are already working flat out on EverQuest II’s thirteenth expansion slated for later this year, so our interview focuses on the few questions that I submitted about itemization and some of the new systems in the update including Heartbound, which is an in-game celebration of the real-life bonds that players have developed, and the new progression-tied Resolve stat. After the jump, our interview! A “Merchant of Rarities” has rare heroic drops from Terrors of Thalumbra dungeons available to players that are looking to pick up an item that has been eluding them, or to get a character caught up to adventure in Thalumbra and beyond! Are you looking for awesome new Green Adornments? Koolor Ironblood has them! Koolor Ironblood can be found in Thalumbra: the Ever Deep. He has items to purchase for status, for platinum, and for Coin of the Eternal Queen. What items are YOU most excited for? We missed the rare raid trash drop cloaks and belts. We will be adding them to the merchant next hotfix. We will absolutely not be adding the rare mythical weapons. Fervor will no longer apply twice when damage is being duplicated from another source. The Weapon of War’s “War” buff can now be properly removed. Hardened By War remains unable to be removed. Prime Vigoth Ansleborg’s flanking order should be less strict to follow for fighters. A new Prestige Server Poll has been launched, check your in game mail for details! The lizardmen in The Fabled Temple of Cazic-Thule will now drop Thulian Puzzle Boxes. Pork Chop should no longer barrel through walls when running in fear in Scourge Keep. Golem hearts are no longer needed to spawn Dread, Fright, or Terror. Today’s update, slated to take two hours, took nearly four. A now locked Discussion on the EQ2 Forums. Fixed a bug where characters logged out in membership only zones would not be playable if your membership lapsed. Added a gong to the arena which can be struck periodically after the arena starts to summon a single enemy combatant a time. Undead orc combatants will enter the arena at a slightly increased rate.